Apalachee Apalachee Province was bounded by the Aucilla and Ochlocknee rivers, around present day Tallahassee. The area was characterized by hardwood forests and fertile soils in the uplands with lakes and rivers providing both aquatic resources and access to the coast via canoes. Rich estuaries and wetlands along the coastal plain formed the southern boundary of their natural environment. This idyllic setting supported a fully sedentary chiefdom whose economy was based on intensive agriculture. Their mainstays of maize, beans, and squash were supplemented with hunting, fishing, and gathering. They were all under the jurisdiction of a principal or paramount chief who, at the time of Spanish contact, resided at a village called Anhaica. There is some documentary evidence to suggest that there may have actually been two paramount rulers: a wartime chief who resided at Anhaica and a peacetime chief who lived at the village of Ivitachuco. However, with the arrival of Spaniards, the wartime chief prevailed. The chiefs of these two villages were identified as brothers by Florida’s Spanish governor.. The most commanding feature of every major village was its council house, the largest of which measured over 120 feet in diameter. These were large circular buildings covered with palm fronds. Council houses had concentric rows of benches. In this painting, I concentrated just on the face to involve the viewer in this warrior's life. I created a more dynamic composition by the use of a normally calm blue background against the dramatic stoic brown face. As with other Native American tribes, birds held a strong spiritual connection for the Apalachee tribe.The colorful painted wood mask with its beautifully crafted copper attachments and feathered circle convey an emotionally expressive statement. This painting is based on an engraved copper breastplate found with a burial of a woman near Tallahassee. Owls had a special relationship with the the Apalachee peoples' religious beliefs. 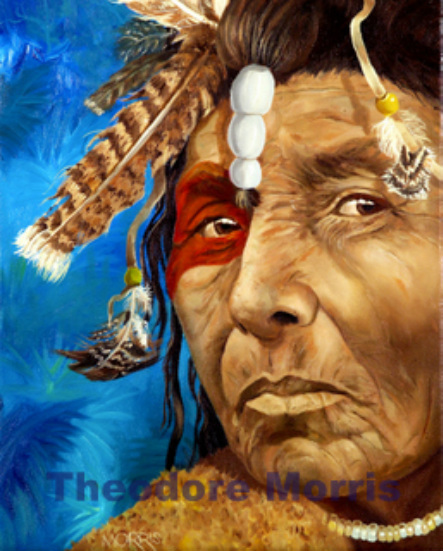 This Shaman's face paint design and forelock with beads are based on an engraved copper plate found near Tallahassee. I used muted warm colors to achieve a spiritual quietness that the viewer is invited to participate in. This intense warrior wears a painted deerskin robe to protect himself from north Florida's frigid winter weather. The symbols decorating the robe were taken from Apalachee pottery. As with other American native Indian tribes, birds held a strong spiritual connection for the Apalachee tribe. I painted the colorful wood mask, with its beautifully crafted copper attachments and feathered circle, to convey emotion and a sense of tradition. 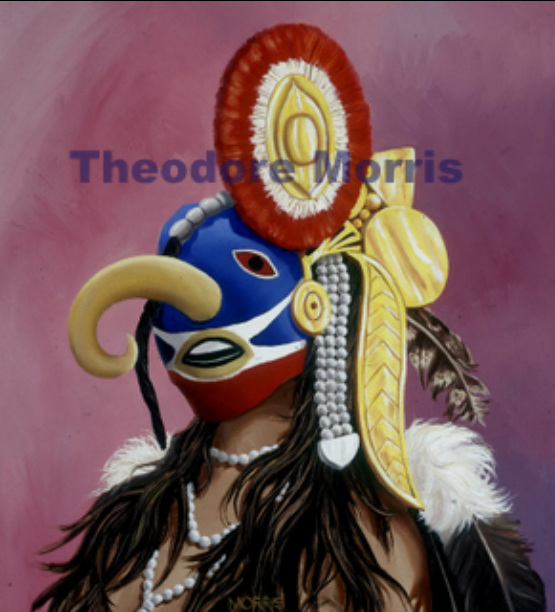 This was my first Florida Indian painting. It was only accomplished with the expert assistance of archaeologists George Luer and Jeffery M. Mitchem, who spent hours in helping me get it as correct as possible.